The M18 Gun Motor Carriage “Black Cat” is a gift Rank III American tank destroyer with a battle rating of 4.7 (AB/SB) and 5.3 (RB). It was introduced in Update 1.49 "Weapons of Victory". 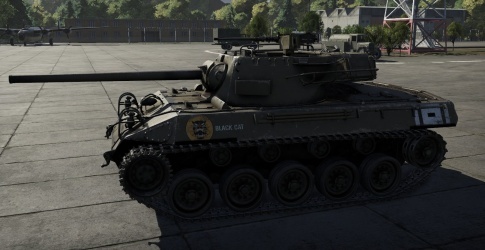 The M18 "Black Cat" is a gift version of the M18 Hellcat, with little difference in performance. It costs $22.99 in the Gaijin Store. The M18 "Black Cat" compensates the lack of anti-tank capability on U.S vehicles by having access to a 76 mm gun with APCR ammunition, all in the battle rating of 4.7. This makes the M18 able to fight off many of the high-ranking vehicles it could face like the Panther D, Tiger H1, KV-1, KV-85, and IS-1. Unlike the other tank destroyers known in the game, the M18 "Black Cat" has access to a 360° traversable turret, allowing players to have a greater arc of fire than a typical casemate tank destroyer like the StuG III, but at the expense of a slightly higher profile. Americans tank destroyers also have very high maneuverability compared to other nation's tank destroyers, allowing it to flank the enemy. 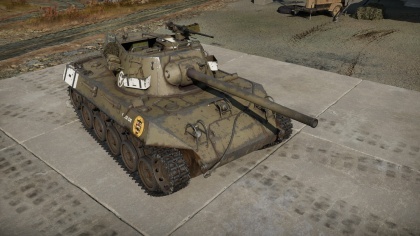 The main weak point of M18 is its very thin armour, a feature that actually allows the M18 to reach its high speed. The thin armour makes it possible for any enemy tanks to penetrate the vehicle. A single hit would destroy many critical components in the M18 or cripple the crew. The only saving grace with this extremely thin ammunition is that standard AP rounds may overpenetrate the armour, doing minimal damage to the internals. Thus, when facing the M18, its best to use AP rounds with explosive fillers or HE and HEAT rounds while avoiding usage of pure AP rounds and APCR. The hull underside right above the tracks are only 8 mm thick. Tracks are attached the the turret rear, granting some 15 mm in thickness. Ammo racks of the Hellcat. Before all, avoid colorful or bright decals. Camouflage is a main part of the M18's defense. Chances for good performance in battle are: be "invisible", fast and effective. The M18's speed is its best ally. This speed has to be used for flanking maneuvers and relocate. Not for trying to cross open field, that will leave it open to enemy fire, speed is not a substitute for armour. Relocate: This movement will have to be done again and again. Choose a good spot wisely, remove the foliage if necessary to get a clear field of fire. When in the fire spot, use the gun depression and stay in a hull down position until a target is located. Once a target is locked on, aim at critical components. Try to immobilize the enemy by firing at the engine or transmission, or remove their firepower by shooting the gun or breech, or for an instant destruction with an aim at the ammo storage. The last option can work very well or not, as skilled players only carry a few rounds of ammo. If positive that the enemy hasn´t discovered the firing spot, go for another shot. Stay attentive that none of the enemy's teammates have also located the firing spot. If detected, hide immediately and relocate. Flanking: Flanking is the most dangerous maneuver of all because the vehicle will have to be exposed as it moves to the enemy's rear, but it is very effective when it's coordinated with other vehicles. A distraction is needed to gain the enemy's attention while the M18 makes its move. Isolated enemy units are very vulnerable to this tactic. Using the M18 speed to get to the rear and as the enemy heads toward the objective, the firing perspective should give a very clear view of the enemy's side armour. A good shot with the M62 APCBC shell could knock out the enemy rather quickly, but if using solid AP shots like the M79, aim at critical components on mobility and firepower before knocking out the crew or ammo stowage. Avoid flat terrain: Flat terrain means that the Hellcat will become an easy target for virtually any vehicle by exposure, especially when not moving or when moving in a straight line. Open plains are the death of the Hellcat. Whenever possible, one should try to stay amongst hills. 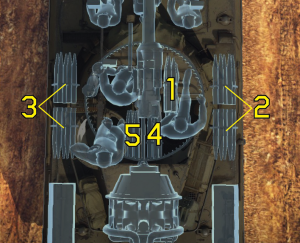 Front armour can cause shells to ricochet off. Weak armour. This can be easily penetrated by heavy machine guns and aircraft weapons. Commander mans the .50 cal therefore is exposed. Stock shells are inadequate against heavily armoured foes. A damaged/disabled engine leaves the vehicle a sitting target. SPAAs can destroy the M18 really quickly. Open top which exposes the crew to machine gun fire and shrapnel. Very vulnerable to artillery barrages. Prone to HE and HEAT shells. The anti-tank doctrine established by the US military called for fast, powerful vehicles able to stop the German blitzkrieg tactics by ambushing the attacking tank forces. Unlike the other armoured fighting vehicles in the theater, the tank destroyers were made to be placed in reserves to counter any breach in the front lines by taking out the enemy with ambushes. This role led to the desire for a fast vehicle with a powerful gun, armour was not a concern due to the emphasis in speed. The initial response was the M10 GMC, made form the Medium Tank M4 Sherman hull and mounting a 3-inch M1918 gun. While adequate at this role, it was no more faster than an ordinary Sherman tank. The M18 GMC was a response to the problem to provide the tank destroyer force with a very fast tank destroyer. The origin of the M18 GMC design came as early as December 1941 with the requirement of a Christie suspension and a 37mm gun. This requirement called for a radical new tank design rather than a derivative of the M4 Sherman. These requirements changed as the war progressed, the first change was to the new and innovative Torsion bar suspension from Buick Motor Division from General Motors and another change was to mount the British QF 6-pounder gun then in use on their Churchill Mark III tanks, the developed prototype vehicle was called the T49 GMC. Then the army wanted the heavier 75mm gun used on the Shermans on it, this prototype was designated the T67 GMC. 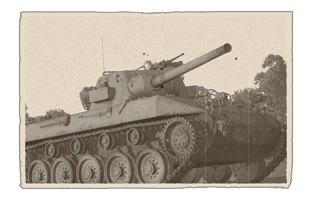 Finally, the army decided to mount the 76mm gun also in development for the Sherman onto the prototype, now known as T70 GMC. Changes to hull shape and turret took place to accommodate all these new requirements and armament, but it eventually was approved for service and finally renamed as the M18 GMC and started production in mid-1943, which went on until ending in October 1944 with 2,507 units produced. A variant called the M39 Armored Utility Vehicle was also produced, its turret was removed for space for cargo, 8 personnel, or to tow guns. These vehicles saw combat debut in the summer of 1944, where they are given the unofficial nickname "Hellcat" by the crews using them. Unlike the M10 tank destroyer that was built before it, the M18 GMC was purely made for emphasis on speed. Armour was restricted down to a maximum of 1-inch (25mm) on the turret front while the rest of the body plating are a measly .50-inches thick (12.7mm). The turret was also an open-top design similar to the M10 tank destroyer, meaning the crew are left exposed to the elements and enemy fire and shrapnel. These faults were mitigated by the fact that as its role as an tank destroyer, it was to have minimum contact with infantry and ambush enemy tanks in concealed position rather than face them in an offensive operation. Nevertheless, the M18 GMC were well liked by the crew for its 76mm cannon, which allows it to destroy the newer German Tiger Is and Panthers tanks from the front with HVAP ammo (though the Panther at close range only) when unable to flank around to the side or rear of these tanks. The speed was also astounding, reaching 55 miles per hour maximum, this makes the M18 GMC the fastest armoured fighting vehicle in World War II and was not succeeded until the third-generation main battle tank M1 Abrams. The name "Black Cat" came from the 805th Tank Destroyer Battalion, Company B where the naming practice for the battalion was the first letter of the company, then "Cats". Thus, a crew in Company B named their hellcat the "Black Cats". While use in the Pacific theater was limited due to the inadequate armour of Japanese tanks, it saw most of its service in the European theater against Nazi Germany. Due to the lack in armour and emphasis on speed, the M18 crews utilize the "shoot and scoot" tactic in attacking the enemy from one position and quickly move to another before the enemy could find their initial firing position, this tactic confuses the German tanks, and could even lead them to believe there are more armoured enemy than what it appears. The M18 GMCs were present during the Battle of Arracourt in France as the 704th Tank Destroyer Battalion. Lt. Edwin Leiper led an M18 platoon of C Company and in the battle knocked a total of 15 German tanks for the loss of three M18; six of these German tank kills, most of which were Panthers, were credited to one M18 led by Sgt Henry R. Hartman. The M18 also played a crucial part in the Battle of the Bulge, where its top speed of 55 mph was finally put to good use in bypassing the enemy forces. Four M18 tank destroyers of the 705th Tank Destroyer Battalion assisted the 506th Parachute Infantry Regiment in attacking the 2nd Panzer Divison and their support to kill the fuel lines to the German tanks. The overall attack had the M18 GMCs credited with at least 24 tank kills of the 30 total inflicted in the attack. Overall, the M18 GMCs proved itself by having the highest kill to loss ratio to any other tanks and tank destroyer in American service, making it the most effective tank destroyer in American service. However, like its other tank destroyer brethens, it soon found itself obsolete along with the entire tank destroyer doctrine. Mainly due to increasing prevalence of well-armoured tanks that could do its job more efficiently such as the M26 Pershing, but also the lack of German AFVs at the time of the war and a study on ammo usage indicates that the tank destroyers spent more time supporting infantry with high-explosive shells than killing tanks with armour-piercing, rendering the anti-tank section an unecessary component in the modernizing armoured forces. Today, some countries in the world such as Yugoslavia still have the M18 Hellcats in reserves. M18 "Black Cat" unit insignia on the hull side. Official War Thunder article: [Weapons of Victory] M18 "Black Cat"
This tank could only be obtained; exclusively with the purchase of, one of the following packs. The packs, are available to buy; on the War Thunder Store page. Weapons Of Victory: M18 Black Cat" This pack only, contains the M18 Gun Motor Carriage known as "Black Cat"
M18 Gun Motor carriage "Black cat"
This page was last edited on 16 March 2019, at 22:15.